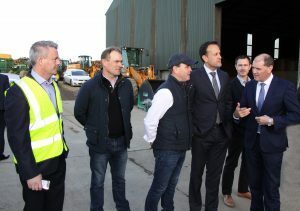 An Taoiseach, Leo Varadkar visited the Clonroche biomass processing hub in Co. Wexford on Sunday 5th November. This hub, operated by T&A Byrne Renewables, services a range of commercial and industrial scale biomass energy clients for both Coillte and Clearpower in the South East and uses predominantly Coillte and the gradually emerging private sector log resource for its supply of biomass. 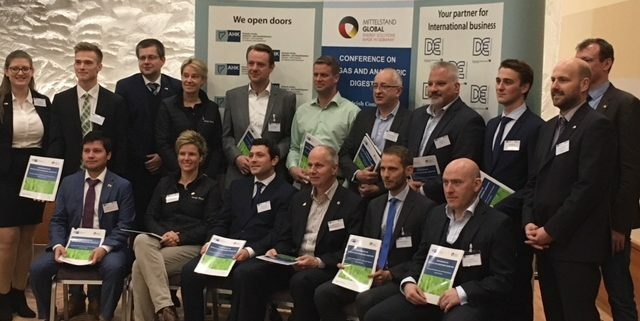 Coillte and Clearpower are both longstanding members of IrBEA. An Taoiseach, along with his colleagues, Paul Kehoe TD, Andrew Doyle TD and Michael D’Arcy TD saw first-hand the contribution a regional processing hub of this scale makes to the local economy as well as hearing the many benefits in terms of displacing imported fossil fuel, reducing greenhouse gas emissions and mobilising Ireland’s forestry resources. The hub comprises of a large secure log storage yard and fuel storage sheds. Coillte logs are sourced and delivered on a pre-planned basis several months in advance. The logs are systematically stacked for open air drying down to the target moisture content. The processing hub, established by T&A Byrne is one of the largest supply hubs of its kind in the country. 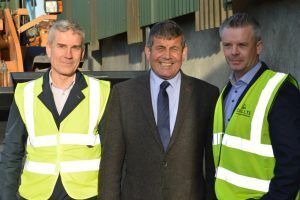 One of the processing hub’s major Coillte clients is Glaxosmithkline (GSK) and their use of woody biomass displaces millions of litres of oil annually. GSK is a science-led global healthcare company that develops a range of medicines, vaccines and consumer healthcare products. For GSK, investing in a biomass plant supports their global carbon reduction objectives and a long term commitment to the Dungarvan site and the local employment it underpins. With Coillte as an exemplar energy supply partner for this project, GSK are further committed to protecting resources and safeguarding the environment. RHI in #Budget2018 – How Does it Look? Budget2018 has seen the launch of €17M for the Renewable Heat Incentive Scheme. €7M is to go towards the first phase of the RHI with the remainder seemingly marked for further uptake of electric vehicles. While at this stage exact details or specifics are not clear this does not send out a very positive signal to the bioenergy industry in Ireland and is perhaps a nudge in the wrong direction. Is this the same €7M that was allocated for the RHI in #Budget2017? It certainly looks like it as that €7M was never spent on any RHI. An RHI scheme was first officially conceived as part of the Bioenergy strategy consultation in May 2013, and formally announced in the October 2014 Draft Bioenergy Plan. There has been a significant impact of carrying on with business as usual over recent years. Approximately 550 toe (tonnes of oil equivalent) of additional fossil fuels are burnt each day as the policy is being developed. Since 2014 c. 800,000 toe have been avoidably consumed. There is also a negative social and economic impact associated with business as usual. There are many bioenergy businesses that have ceased to exist due to industry stagnation since 2008. Many skilled people have applied themselves to other technologies or other jurisdictions to make ends meet. 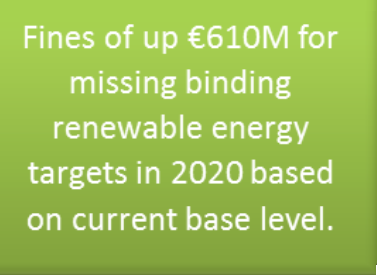 At a time when the Government is in a big race against time to avoid a potential fine of at least €610m from the EU for failing to hit renewables targets. 2017 looked set to be a defining year for the country’s energy sector and the clock is ticking faster than perhaps the Government would like. At this stage 2017 has come and gone. If Ireland fails to meet an overall binding target of generating 16% of renewables composed of electricity (40%), heat (12%) and transport (10%) within three years, a penalty of up to €120m will be imposed by the European Commission for every 1% the State falls below this target. It is currently set at 8.6% so quite a path to travel. By 2030 the target is set at 27% renewables with even greater fines being proposed. Minister Naughten is under pressure to implement policies to help avoid or reduce the potential bill facing Irish taxpayers and he has failed to listen to the advice of the bioenergy industry in Ireland. Instead of paying €610M in fines to EC, surely these potential fines would be better spent implementing and approving budgets for new policies such as the Renewable Heat Incentive (RHI). 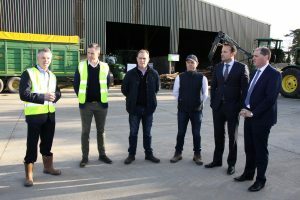 Minister Naughten thinks that the bioenergy industry in Ireland is sound and secure. The disasater that was REFIT 3 is testament of this with a low uptake, wrong strike price and burdensome administration. The RHI needed to be launched with more conviction to enstill confidence back into bioenergy. The European Commission has highlighted the country’s unimpressive status by ranking Ireland 23rd out of 28 member states for renewable energy. Critics of the Government’s strategy on renewable electricity blame Ireland for having relied too heavily on onshore wind to reach its targets. This is testified by how many days Ireland can run on bioenergy which is currently only 13 while Sweden can last 132 days and Finland 121 days. Socio Economic Impacts of an RHI Scheme that may be lost due to delays include New investment in biomass heating of over €220M. Annual spend of over €77m on operation and maintenance. €1.5 billion of direct investment into the Irish economy. 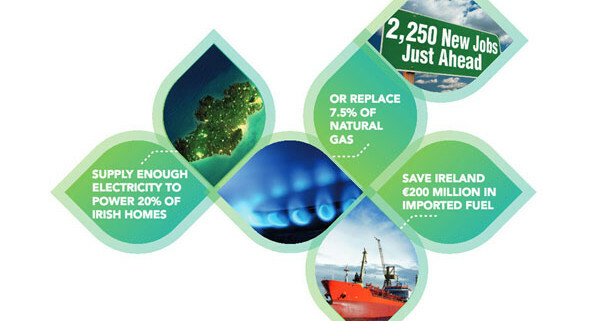 Reducing Ireland’s energy import bill by 7.5%. Matching locally grown biomass with local energy demand will support 3600 new jobs. RHI will displace €120M/year of imported fossil fuel and encourage indigenous security of supply. https://www.irbea.org/wp-content/uploads/2018/01/RHI-1.png 275 377 demoirbea2015 /wp-content/uploads/2015/10/irbea1-300x119.png demoirbea20152017-10-25 16:08:362018-01-25 17:00:26RHI in #Budget2018 - How Does it Look? Ger Devlin was presenting at the Wood Heat Association Conference in the UK on the 21 & 22 November in Dorking. He will be talking about the Irish RHI schemes and the industry’s expectations going forward. As a strategy it is an ambitious plan to achieve important targets for renewable energy. The weakness in the plan is the ability to convert this ambition into action. For example, a renewable heat incentive was promised since May 2014, and at the earliest this will commence at end of 2016. This long roll-out has resulted in market stagnation. The report accurately points out that Bioenergy has the potential to create 5000 jobs as well as reducing our carbon emissions, however these benefits can not be fully realised unless the proposed policy measures are promptly implemented. 1. Bolstering his department with the necessary resources to undertake this challenge. 2. Fastracking proposed support schemes for renewable heat and electricity.